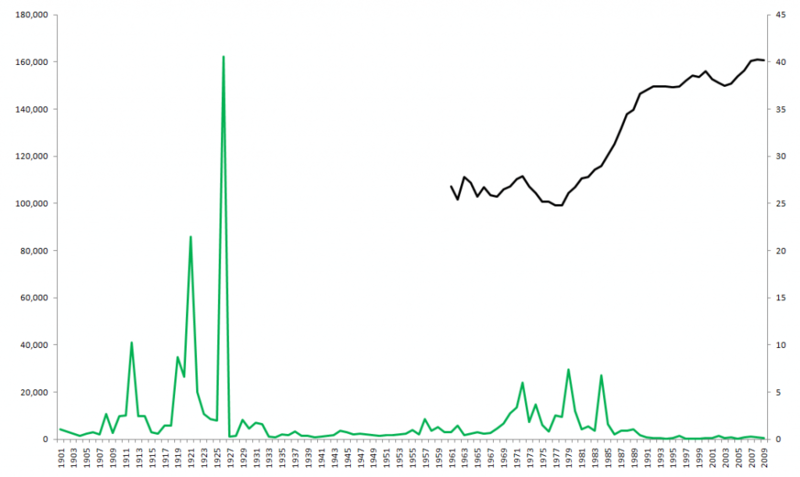 I was looking into the historical data on strike days in Britain for a feature in Catalyst, but there's a lot more to discuss than we could fit in the paper, so I've extended it to a blog post. This is the graph we printed in Catalyst. 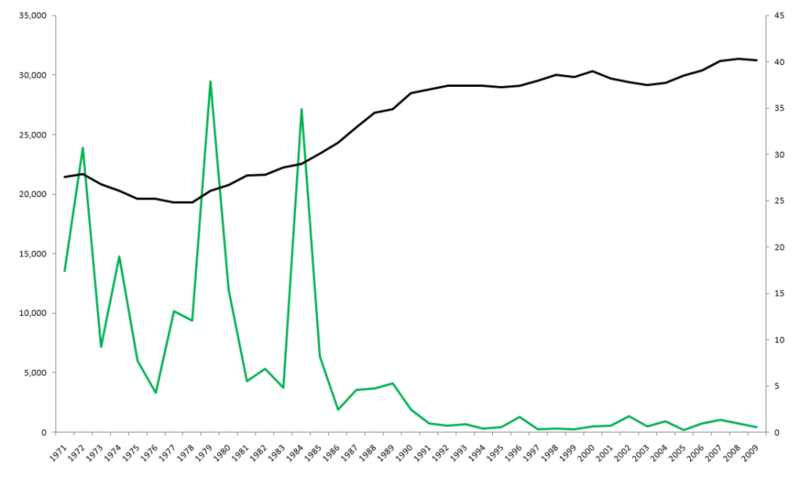 The green line represents thousands of strike days and is read from the left y-axis, black represents inequality as measured by the Gini coefficient, and is read off the right y-axis (100 = one person owns everything and 0 = perfect equality. Worldwide, Gini coefficients range from approximately 23 (Sweden) to 70 (Namibia) although not every country has been assessed). Click on the charts for high-res versions. We flagged up three main points of interest. (1) In 1976, as the wave of struggles which brought down Ted Heath's Tory government and forced up wages subsides, Labour call in the IMF. This seems to mark the end of the post-war settlement and is the beginning of rising inequality. (2) Workers respond with a wave of strikes, many of them unofficial. These culminate in the ‘Winter of discontent’ in 1978/9. (3) Thatcher’s Tory government smashes the workers’ movement, leading to a dramatic fall in strike days and a corresponding rise in inequality. The graph tells a familiar story - industrial unrest was high in the 1970s, but was smashed by Thatcher in the 1980s leaving us with the very low strike rate we have today. But really we need a longer perspective to make sense of this. The next graph shows strike days since 1901 (inequality data only goes back to 1961 as far as I can find). Two main things jump out at me here. Firstly, the historic highs of strike days in the first graph are put in context of a wave of struggles lasting roughly 1968-1979, with the '84/'85 Miners' Strike being a last gasp battle of that cycle of struggles. 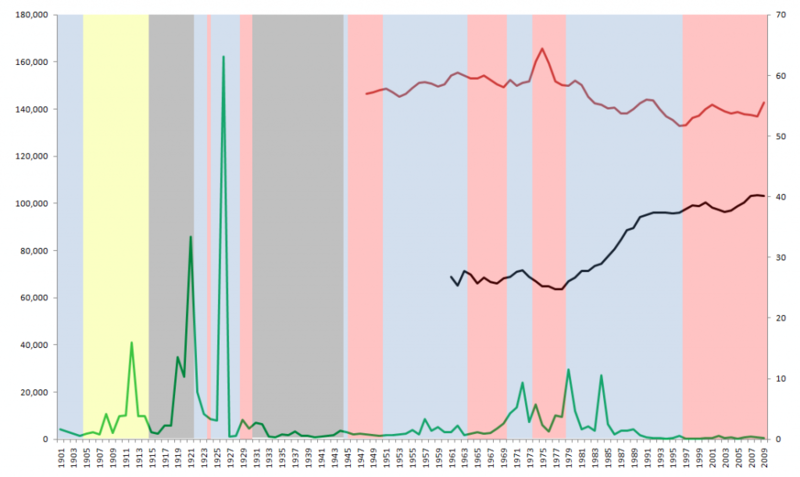 Before that, there was a long period roughly 1933-1955 of very low industrial unrest, following the previous cycle of struggles lasting roughly 1918-1926 (the pre-WWI spike is the 'Great Unrest', including the 1911 Liverpool General Transport Strike and the 1912 Syndicalist Trials). The 1926 spike is of course Britain's only national General Strike. This is an interesting counter to the fashionable tendency to consign the class struggle to history. I'm sure people were saying similar things prior to 1968. In fact, they were. Secondly, these two cycles of struggle have an international character - the first includes the Russian Revolution, the German Revolution and the high points of Italian and American syndicalism, amongst others, while the second wave included Mai '68, the Hot Autumn in Italy (photos) as well as the Prague Spring, student revolts in Mexico and the US and more. It would be interesting to graph this unrest from around the world. I think Beverly Silver was involved in compiling a database of world labour unrest from newspaper reports - but stuff like this is a PhD-sized research project and this is just a blog post! Without inequality data pre-1961 it's hard to say more on that. But we can use a proxy: wages as a percentage of GDP (the pink line, read against the right y-axis). Now I can only find this data back to 1948, and it isn't an ideal proxy since it doesn't say anything about the distribution of wages and almost certainly includes senior management and maybe even directors' pay (I can't be bothered to check the ONS methodology for a blog post tbh!). But nonetheless the pink line does roughly inversely track the black one, suggesting it's a workable proxy: when wages make up a higher percentage of GDP, inequality is lower. The post-war period then seems to be one of stable or slightly falling inequality, coupled with relatively low and stable strike activity (although higher than today), which goes into crisis around 1968 with a wave of struggles (themselves responses to various things) pushing up wages and bringing down inequality, toppling governments and causing the IMF to be brought in. Subsequently, Thatcher's government comes in and smashes the miners, allowing the rising inequality to continue unopposed. 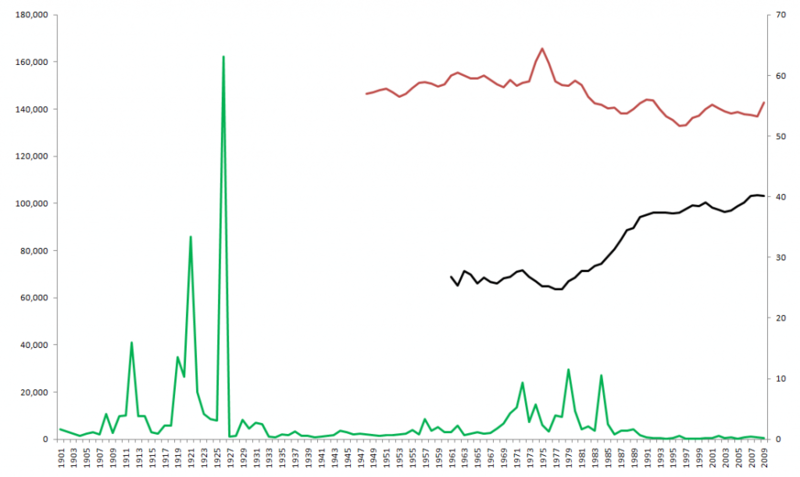 This looks quite a bit like punctuated equillibrium, with a relatively stable social democratic mode of accumulation from 1947-1968 going into a decade of crisis before being replaced dramatically with a neoliberal one, based on higher inequality and lower strike activity. Having mentioned Thatcher, it's probably worth considering what relationship this all has to political parties, before speculating a bit about what a crisis of the neoliberal mode of accumulation may look like. In the fourth chart, governing parties are superimposed - red = labour, blue = tory, yellow = liberal and grey = coalition/unity government. Most strikingly, the longer term patterns seem completely indifferent to governing party. Inequality began to plateau in 1989 under the Tories, but has kept creeping up under both Tory and Labour governments. Strike days crashed after the defeat of the miners and Wapping, but stayed low under Labour too. It's only really in the shorter-term where there's any correlation at all. In 1974 the miners strike brought down the Tory government and ushered in a Labour one. Inequality fell and so did strike days - for a couple of years until they picked up again and the Tories swept back into power. So wherever there seems a correlation, the causality seems to be driven by the class struggle and not the other way around, since in the absence of increased struggles there's no obvious differences between the parties. The IMF and ECB are urging Europe to create a new bailout fund to operate thereafter in which private investors never take a hit, ever. (...) After three years of agonising about moral hazard we are basically creating a system where banks and pension funds can lend money to EU governments with a cast iron guarantee they will get their money back. It is great if you think we should be moving towards a new state capitalism, where the state becomes the permanent underwriter of financial profit, but it is not really a market. This may well help reassure investors and keep a lid on the current crisis, but it's impossible to see how this isn't storing up big trouble for the future. Guaranteeing private financiers against losses is sure to encourage further creative manipulations like those involved in the sub-prime bubble, and contribute to an even bigger crisis down the line. We're getting highly speculative here, but that's what I'd guess will mark the '68 moment' of neoliberalism, with increasing austerity and financial instability provoking more social unrest and workers struggles and perhaps a capitalist backlash against deregulated finance. Lurking in the background here is the geopolitical power-play of the rise of China. A fair few commentators seem to think both China and the US are expecting a binding CO2 emissions regime in 10-15 years time, and are now jostling for leadership position. China is now the world's leading producer of wind turbines for instance. So if I had to guess, I'd imagine neoliberalism will stagger on for another 10 years or so before financial instability and social struggles make it untenable, and there's a move to reregulate global finance within some kind of binding CO2 emissions regime, probably with China finally shedding the 'sleeping' part of its giant moniker. But like I say, predictions are a fool's game. SOURCES: Office for National Statistics (ONS) and the Institute for Fiscal Studies (IFS) Income and Inequality spreadsheet complied from ONS data. That's some very interesting graphs. Goes against traditional wisdom about the "objective conditions". Would be interesting to see if the pattern is the same in other countries. What about interpreting this stuff alongside Silver's Forces of Labor (argument is focused more on particular industries as far as I remember, but maybe there's something there)? Forces of Labor has global cross-industry data from 1871 - 1991. If anyone is going to rely on it, I recommend reading the special issue of the Fernand Braudel Centre Review where they defend Silver's methodology. It's a very impressive book, but there are flaws with it IMHO. e.g. a mention of a revolution counts for as much as a mention of a strike. Now you could say that revolutions will be mentioned more than strikes, but proportionately more, considering their significance? There are also issues with the countries they've selected to do the focussed confirmation on - I think if they'd chosen different ones they would have got different results. Anyway, interesting post. If you're interested in this sort of stuff, a good data series to look at is the wage share and profit share of GDP. I would speculate that capital's major contradiction in the developed west at the moment is that they attacked the working class too effectively at the end of the '70s, pushing down the wage share, hence domestic consumption, and consequently making economies more sluggish, less innovative (relatively lower wages => less pressure to spend on R&D and new machines), and crisis prone. This is more or less a milder version of Marx's point about capitalism increasing unemployment through technical change, but then having difficulty selling the products of that technical change. They re-established short term profit at the expense of general dynamism and security; and the political reproduction of capital at the expense of its economic reproduction. 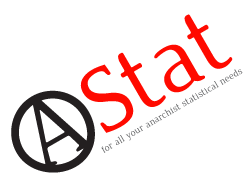 We need more communist statistics, so nice one. In the back of my mind is Arrighi's thesis about shifting centres of capitalist accumulation ('systemic cycles'), hence the mention of the rise of China at the end. This doesn't directly map to that, but i think there's a geographic dimension to this, which struggles (that Arrighi ignores but Silver emphasises) have explanatory power in; i.e. the way Silver traces labour militancy chasing capital to new spatial fixes. It's a big and fascinating topic, i'll try and look into it more in future and do similar blogs. That's awesome, thanks for posting. Communist graphs FTW! It would be useful to have a look at these figures compared with Beverly Silver's world labour group database, to see if that really is a better indicator of class struggle. I did e-mail for asking her for the raw data, to see if we can do anything with it, but she didn't get back to me. It's also good that it does support what we would think would happen from our politics. A tricky thing, however, is that actually strike days don't tell us everything. For starters, do strike days include wildcat strikes? If not, then the number from the 60s will be massively underestimated, as 90% + of strikes then were wildcat. Also, if workers are well-organised, and prepared to strike, then they may be able to win significant gains by just threatening to strike. This would be indicative of a more militant workforce, than one which was weakened, and had lots of defensive strikes which were lost (when inequality would then increase). I presume this is a typo, but it is 1974 not 6. This article: http://libcom.org/library/fragile-prosperity-fragile-social-peace-collective-action-notes has a bit about how changes to the way the US government collected strike statistics "reduced" the number of strikes. I read somewhere that in Australia the wages share of GDP is pretty closely correlated to days reclaimed by strikes. yeah, plus a lot of the most militant disputes were won in a matter of minutes on the job by temporary stoppages etc which would never make it into the stats. plus there's things like the anti-poll tax movement, or rent strikes, which are mass working class direct action every bit as much as stop-work strikes but wouldn't be picked up in such a measure. but annoyingly governments don't seem to go out of their way to record such information! as a rough guide to the level of open class struggle, strike days aren't a bad headline indicator, but obviously they don't tell the whole story. there's similar problems with whatever you pick as a measure of inequality. i flagged up that 'wages' quite possibly includes lots of bosses in the wages vs GDP measure, while the gini coefficient also has its limits (e.g. it dips slightly at the start of the recession in 2009 - i imagine this is falling property prices disproportionately impacting rich buy-to-let landlords and the like, temporarily lowering inequality. but by the time we have 2011/2012 data i'd expect inequality to be even higher than before the recession). By the way, I just wanted to say that this was ace reading.. I don't know if it'd be too presumptuous on your behalf, but you ever contact Silver (what with your academic, anarchy, and Aufheben credentials)? It'd be interesting to see what she says. I think its also interesting that government's only change colour when there is something else going on, most of the time related to class struggle. It'd be cool to chart sick days against this as well. I'll look into it; according to that AF pamphlet there's an inverse relationship to strike days, which would chart the atomisation of alienation under neoliberalism pretty well. At a glance i can only find sickness data since 2000, and it's not immediately comparable with strike days as it measures number and % of employees sick (presumably, number of people who took at least one sick day?). Fwiw it shows a downward trend, but 10 years isn't a lot of data to be speaking of trends really. Very nice charts and post. I think one thing that may improve it, however, is to graph the change in strike days and gini-coefficient - i.e. index them both to 100 in 1961 or whatever year since then you're most interested in - that way it's much easier to see the interaction between the two. I would be very interested to see the graphs done this way. Also, as a very minor point, labels on the charts (particularly the final one with the shaded areas for parties) would help as well as I had to jump back and forth between the post and the larger versions of the graphs. I know this is a while back now, but can I ask where on the ONS site you found the data for this? I had a look under 'Income Distribution of Individuals', but I haven't been able to find anything seeming to match. I can't remember off the top of my head. The spreadsheet's on my old laptop but I'll see if I can find the source data.